As some of you might now, one of the reasons we moved to Nogglestead was because I wanted a big garden and an orchard. After all, at our house in Old Trees, we had a couple upstart fruit trees, raspberry bushes, and an awesome garden. Imagine what I could do with more land! Well, we had a good first year, but the next couple of years were pretty dry and other things took precedence in other years so that our garden and our fruit trees never really produced. But this year, we’ve put in effort as a family and we’re having some luck with it. But now that we’ve got produce, we’re learning what in nature will eat it. Our orchard has been slow to take off. We lost a year to deer destroying the first trees, and then a couple drought years and a late freeze kept us from fruit. But this year, the peach trees in the front had a bunch of peaches. And now they have additional bunches of bugs. 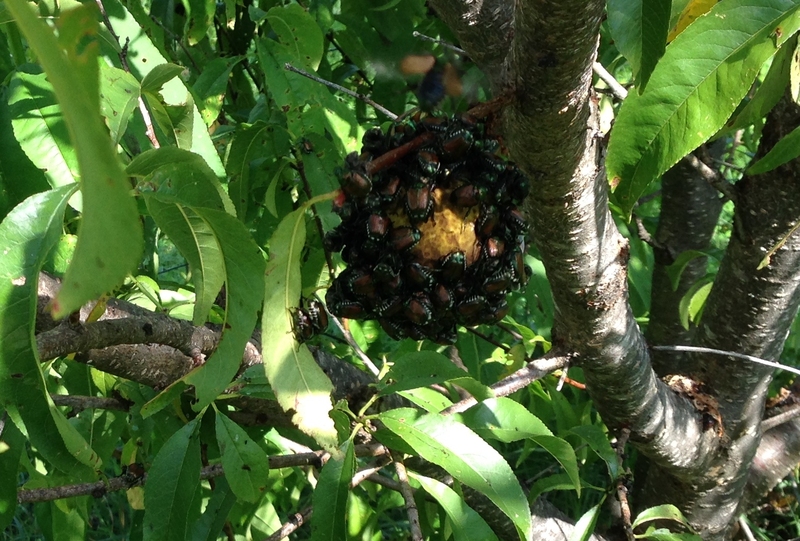 So I guess next year we’ll spray insecticide on the trees. The cherry trees had cherries. Then the deer or birds had cherries. Next year, I guess we’ll put netting on it. Something is nibbling on our cantaloupe. Probably something small. We didn’t have an extensive problem with melon-munchers when we had outdoor cats. Perhaps we’ll have to see if we can lure some of the neighborhood outdoor cats into our vicinity again. So I won’t be learning any peach cobbler recipes this summer. But we’re learning, slowly, through the “success” of this year what we need to look out for next year.